Rob Schmitz is the China correspondent for NPR’s Marketplace, and he lives on a street in Shanghai whose name translates into English as “Street of Eternal Happiness.” In 2012–2013 he reported a series of short stories on the people he met along the street, which lies in the former French Concession. Later, he reworked and expanded that material into a book: Street of Eternal Happiness. The stories Schmitz tells come together to give us a picture of what it’s like for people of various ages and backgrounds to navigate the political, cultural, and financial realities of modern-day China. The book comes in 15 chapters, with 2–3 each dedicated to telling the stories of various people along the street. There is CK, the young entrepreneur who sells accordions and is struggling to get a sandwich shop off the ground. There are the residents of Maggie Lane, the area behind Schmitz’s apartment building, who don’t want their homes to be demolished and the area redeveloped, but are continually harassed by unscrupulous developers. There is Zhao, who left her husband, came to Shanghai, and was eventually able to open a flower shop, but is now trying to pass on her will to succeed to her two sons. There is the family of Wang Ming, a businessman who used to live along the street. He might have become rich if he lived today, but in the ’50s he was condemned as a capitalist and sentenced to hard labor while his wife was left to raise their seven children. And my favorite are Auntie Fu and Uncle Feng, the bickering couple who are kept on the brink of financial ruin by Auntie’s attraction to get-rich-quick schemes. These cameos show us as well as any book on history or economics what it is like to live in China today: to experience a growing economy that grants increasing opportunity, but also has corruption and injustice. To live with a government that sometimes seems to be granting more freedom, but also sometimes seems to be out of step with the realities of the everyday life of the country’s people. I would recommend this book to anyone who is interesting in learning about what it is like to live in modern-day China. The stories make it a fascinating read even for those, like me, who are relatively unfamiliar with Chinese culture and history. Dave Ramsey has created a successful career out of telling people what to do with their money. I’ve listened to his radio show several times, and I can see why he is so popular. He has a no-nonsense demeanor, and his moral universe seems to have few or no gray areas. You’re either right or wrong, smart or dumb. His personality is perfect for getting people motivated to get out of debt and build wealth. But the ultimate goal for Ramsey is not just to build wealth; it is to become generous and leave a legacy to one’s family and community. Popular as he is, Ramsey has received criticism from various quarters (here, for example). This criticism ranges from his specific financial advice to the way he talks about poor people. While I think Ramsey could certainly be more nuanced than he is, I think the criticism of the latter misunderstands who Ramsey’s audience is and what he is trying to do. Ramsey is a motivator. He wants to get people fired up about getting out of debt. His comments about being poor are not intended to be nuanced, taking into account every reason why people might be poor. I think, for example, that he is wrong to generalize that poverty caused by injustice is not a first-world problem. In his moral universe, poverty is something to be escaped. When he talks about poor people, he is not talking about the poor in spirit to whom belongs the kingdom of God. He is not primarily talking about people who are poor because they are oppressed by people with more power than them. He is talking about the kind of poor people—people who waste money on frivolous spending and servicing debt—that his primary audience doesn’t want to be anymore. His advice to that demographic has helped many of them escape debt and build wealth, and he is (rightly, I think) beloved by them. Ramsey is at his best when he is counseling people to resist a culture of overconsumption. He is at his worst when he makes generalizations about the causes of poverty—as are we all. Even the Bible doesn’t generalize about the causes of poverty. Compare, for example, Proverbs 13:23, which attributes poverty to injustice, with Proverbs 10:4, which attributes it to laziness. If even the Bible doesn’t make sweeping generalizations about the causes of poverty, we shouldn’t either. Ramsey should stick to what he does best, and his critics should recognize what he is trying to accomplish. Note: Thanks to Thomas Nelson for providing a copy of this book in exchange for an honest review. 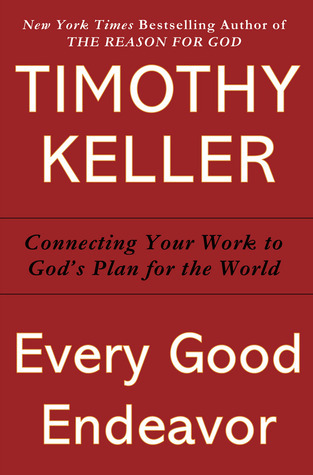 Since 1989, Tim Keller has been pastor of Redeemer Presbyterian Church in New York City. Many people in his congregation have questions about how their faith and work can coexist. This book, co-written with Katherine Leary Alsdorf, the head of Redeemer’s Center for Faith and Work, is his response to their questions. The book comes in three parts: in the first, he writes about how God intended work to be from the beginning. In the second, he deals with the problems we have with work in a fallen world. In the third, he lays out the different effects the gospel has on work: it fits work into a different story, it gives us a new understanding of what we are doing when we work, it gives us a different set of ethics to apply at work, and it gives us new energy for work. As is typical with Keller, he draws on a wide variety of sources to make his arguments and illustrate his points, like jazz saxophonist John Coltrane, theologians John Calvin and Martin Luther, and philosophers Alasdair MacIntyre, Luc Ferry, and Nicholas Wolterstorff. Some of Keller’s favorites are early 20th century British writers like C.S. Lewis, J.R.R. Tolkien, and Dorothy Sayers, and they make several appearances as well. While from the outside there might not be immediately noticeable differences between a well-run company reflecting a gospel worldview and one reflecting primarily the world-story of the marketplace, inside the differences could be very noticeable. The gospel-centered business would have a discernible vision for serving the customer in some unique way, a lack of adversarial relationships and exploitation, an extremely strong emphasis on excellence and product quality, and an ethical environment that goes ‘all the way down’ to the bottom of the organizational chart and to the realities of daily behavior, even when high ethics mean a loss of margin. In the business animated by the gospel worldview, profit is simply one of many important bottom lines (167–68). Every Good Endeavor is a theologically robust reflection on the nature and purpose of work from someone who has spent a lot of time reflecting on it. It corrects many misunderstandings about work and gives a positive vision for what it can be. I recommend it highly. The goal of the Church and Postmodern Culture Series is to examine some aspect of postmodern theory and determine what it might mean for the church. In this, the latest book in the series, theologian Daniel M. Bell, Jr. mines the thought of Gilles Deleuze and Michel Foucault to see what they might be able to teach the church as it confronts capitalism. When Bell criticizes capitalism, what he means by “capitalism” is not the free market, but the dominion of the market—the marketization of all of life. Bell does not propose socialism or communism or any other economic system as a viable alternative. Rather, he pits capitalism against what he calls “the divine economy.” He writes, “By setting Christianity against [capitalism] I am suggesting that the market should be neither total nor free. That is, it should not be the central institution in life and society, nor should its capitalist logic go unchecked. More specifically, I am suggesting that the market, and indeed the discipline of economics, should be subordinated to theological concerns.” The market economy, for Christians, should be subordinated to Christian virtues like generosity and justice. The main insight that Bell takes from Deleuze and Foucault is that capitalism is an economy of desire. That is, in spite of the claim that capitalism enhances freedom, it actually disciplines desire in a way that precedes and shapes what choices people are able to make. Bell’s alternative to capitalism is not a blueprint that he intends the world to follow; it is a call for Christians to act economically the way they say they believe. We were, Bell says, “created to desire God and live in communion with one another in God” rather than pursue individualistic self-interest, as capitalism instructs us to do. We were meant to find our rest in God, rather than experience a restless and unrelenting desire for more stuff. We were meant to serve the common good, because our neighbor has a claim on us; we are not limited to voluntary associations, as capitalism has taught us to believe. Bell claims that capitalism’s Christian defenders tend to have a distant God who is not active now in bringing about human sanctification. If God is not active, and we are left to shape life as we see fit, then all we can do is manage sin, and capitalism is superior to the economic alternatives. But even though the kingdom of God has not yet come in its fullness, God is active in bringing it about even now; and so an alternative to capitalism is possible. There is more food for thought in this book than can be contained in a short review. Even though it is challenging reading, particularly in the early chapters when Bell is discussing Deleuze and Foucault, it is rewarding. 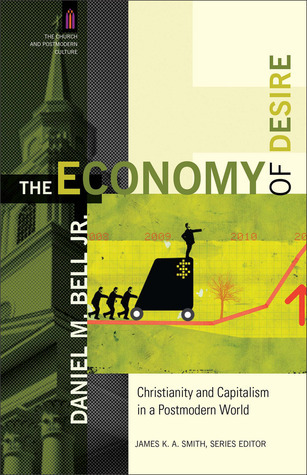 Bell does give examples of how the divine economy is being hinted at even now, such as L’Arche and the Catholic Worker movement, but I wish that he had made room to go into more detail and to tell more stories about how they challenge capitalism. I recommend it to any Christian who is interested in economics. In his newest book, Fixing the Moral Deficit: A Balanced Way to Balance the Budget, Ron Sider writes that there are three crises facing America today: a deficit crisis, a poverty crisis, and a justice crisis. Seen together, these three add up to a moral deficit. This short (171 pages, including notes and an index) book is his attempt at a solution. In the brief first chapter, Sider argues that the crisis is a real one. He then argues that in order to solve the crisis, we need an understanding of the economic facts (which he provides in chapter 2) and a set of biblically grounded moral principles (which he provides in chapter 3). Then in chapter 4 he looks at current proposals, such as the budget proposed by Republican congressman Paul Ryan last year (Ryan, a Catholic, was in the news recently when he was criticized by Catholic bishops and Georgetown University faculty for saying that his economic views were informed by Catholic social teaching). In chapter 5 he gives his own proposal. In a short concluding chapter, he makes a final appeal for readers to take the crisis seriously and do something about it. The greatest strength of this book is that it is a serious attempt to look at a huge public issue from an explicitly Christian standpoint. The current state of U.S. political discourse puts pressure on people to conclude that there are only two political choices: radical individualism on one hand, and communal collectivism on the other. Christians all too often allow this pressure to push them into one camp or the other, rather than questioning the terms of the debate. Sider does this, and concludes, I think rightly, that “[b]iblical faith combines an amazing personalism with clear communalism” (44). He critiques both the followers of Marx and of Ayn Rand. 1. In our understanding of persons we must hold together two truths: persons are made both for personal freedom and responsibility, and for communal interdependence. Radical individualism and sweeping collectivism are both fundamental mistakes. 2. We do have responsibility for our neighbors. Jesus commands us to love our neighbor as ourselves. But genuine love for neighbor requires not unending handouts but a tough love that does what is in the genuine long-term interest of the neighbor. 3. God and God’s faithful people have a special concern for the poor. Since God measures societies by what they do to the people on the bottom, we must evaluate proposals to end the deficit crisis by what they do to the poorer members of society. 4. Justice does not demand equal income and wealth, but it does require that everyone has access to the productive resources (land, capital, education) so that, when they act responsibly, they will be able to earn an adequate living and be respected members of society. It also requires that those unable to work (children, the disabled, the elderly) enjoy a generously sufficient living. 5. Economic equality is not a biblical norm. But economic inequality that harms the poorer members of society and prevents them from gaining access to productive resources (e.g., quality education) is wrong. Furthermore, economic inequality that places most of the political power in the hands of a few will almost inevitably lead to great injustice. 6. Government is only one of many crucial institutions in society, and its power must be limited. But in biblical teaching, there is a significant, legitimate role for government in caring for the poor and promoting economic opportunity. It is simply unbiblical to claim that caring for the poor is only a responsibility of individuals and private organizations but not the government. 7. Intergenerational justice is important. One generation should not benefit or suffer unfairly at the cost of another. Scripture clearly teaches that parents should act in ways that help their children to flourish (Deuteronomy 6:7; Psalm 78:4; Joel 1:3). To continually place current expenditures on our children’s and grandchildren’s credit cards is flatly immoral (69–71). It would be a huge step forward if all Christians followed Sider’s example and talked about the deficit crisis from a particularly Christian perspective. In other words, there is a theological debate that we should be having, rather than simply taking our cues from the wider cultural discourse. We should be asking what people are for, and what our responsibilities are to our neighbors, and what the Bible says about all of this. Too often we just kind of drift into the political tribe that our friends and neighbors are a part of. That’s irresponsible. I’m sure that not even everyone who agrees with the above principles will agree with Sider’s specific policy proposals, but everyone will benefit from reading a thoughtful discussion of budget issues that is not shrill or accusatory. Note: I received a copy of this book from Intervarsity Press as part of the Goodreads “First Reads” program. I was not asked to give a positive review. 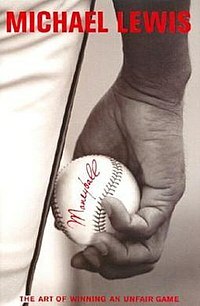 In January I posted on Moneyball, because I had just read the book and watched the movie. I’ve grown to appreciate the writing of Michael Lewis as a result, and over the past few months I have read the series of articles he wrote on the recent financial crisis, mostly in Europe. As is the case with most of his writing, what makes him so interesting to read is that he takes complex economic forces and tells an interesting story about them. The conceit behind these stories is that each country was allowed, between 2002 and 2008, to be left alone in a dark room with a huge pile of money. What they did with it, says Lewis, opens a door onto their national character. He paints with very broad strokes, and can fall into stereotypes as a result, but I still found the articles entertaining. Germany: It’s the Economy, Dummkopf! But at the same time, the reason we have welfare capitalism today—modified capitalism; qualified capitalism—is that unrestricted capitalism is brutal beyond belief. Do we want to go back to 7-year-old children working 14 hours a day in factories? That’s what capitalism produced. Is that all right? No, but there are people who say that if only we rescinded all governmental interference in the market, and we had laissez-faire capitalism, no restriction on what an employer can do, that that would promote that good which communism claims to promote. Well one’s as evil as the other. My old philosopher friend, Emile Fackenheim, used to say, “Under capitalism, people devour each other. Under communism, it’s the other way around.” And I think it’s true. Because all of these are a form of perfectionism which ultimately denies that since we were created ex nihilo by God, he alone ultimately is our determination. … Marxism and capitalism would say alike that what is finally our determination is what we do with the element of the material. That’s our determination: what we do with matter. Now communism and capitalism want to do very different things with it, but they would say that’s our determination. We [Christians] deny that. There you have it; pure communism and pure capitalism are both utterly materialistic. They insist on seeing the world apart from Christ, who holds it together. They ultimately fail because of a faulty understanding of the human situation, particularly (though Shepherd doesn’t mention it here) a huge blind spot when it comes to human sin. And that, friends, is why I reject both as sub-Christian, and sub-human, ideologies. Michael Lewis certainly has a sense for a good story. Lewis is the author of The Blind Side and Moneyball, among other books, and the thread that seems to run through his work is an interest in value and a talent for telling a story about how it is created. In The Blind Side, the value that he was interested in was that of a football lineman who plays on the left side of the offensive line, thus protecting the “blind side” of a right-handed quarterback. To explore that value, he told the story of Michael Oher. In Moneyball, the value that he was interested in was that of baseball players. The story he told was that of the cash-strapped Oakland Athletics and their general manager, Billy Beane. 1. When evaluating baseball players, measurables should be valued above intangibles. This means, for one thing, that you tend to draft college players more than high school players, because college players have a larger body of work. 2. When you are a baseball team without a lot of money, you need to look for players with measurables that are undervalued. Players who have measurables that are highly valued tend to be paid more, and so they tend to play for teams that can pay them more, like the Yankees. So you look for players like Chad Bradford, who was a good relief pitcher, but who was undervalued because he had an unusual throwing motion—he threw underhand. Lewis followed Beane around during the 2002 baseball season and interviewed him several times. The fun thing about reading Moneyball all these years later, as someone who follows baseball, is that I know how things turned out for many of the players mentioned. Nick Swisher, for example, was the player that the A’s wanted most in the 2002 draft. They got him, and he played for them for several years, but now he plays for the Yankees. Another player the A’s drafted that year is Joe Blanton, who now plays for the Phillies. Most of the other players selected by the A’s that year did not make it to the major leagues for long, as pointed out by this article on espn.com. As Paul DePodesta—who was Beane’s assistant GM in 2002—points out, that is more of a reflection on the nature of baseball’s draft than the A’s philosophy. Lots of draftees, even in the first round, just don’t pan out. The movie was generally faithful to the book. The one major change was that, since DePodesta did not want to be portrayed on screen, Beane’s assistant GM in the film is a composite character named Peter Brand. Also, Beane’s daughter does not feature in the book, but she does in the movie. One problem with “moneyball” is a problem that it shares with all other forms of empiricism: It tries to turn everything into a measurable quantity. This probably works better in baseball than it does in most sports, because of the sheer number of statistical categories, but eventually it reaches its limits. It tries to be objective, when it is impossible for humans to be completely objective. Lewis points this out in the book, as he describes Beane’s quirks and the ways in which he behaves that are not entirely rational. Another problem with “moneyball” is that eventually you run out of statistics that are undervalued by other teams. This has apparently been the case with the A’s over the last several years, as other teams have seen their success and adopted their methods. Former Red Sox G.M. Theo Epstein, for example, wholeheartedly adopted Beane’s style of player evaluation, but with an important difference: the Red Sox have way more money than the Athletics. Since Moneyball was published, the Red Sox have won two World Series, and the Athletics have won none. That’s not to say I don’t like the book or the movie. I enjoyed both; it’s a fun underdog story about challenging the status quo. I’d recommend both, and I look forward to reading more Lewis. This book is Theodore Roosevelt Malloch’s argument that capitalism is most successful when it is conducted in a virtuous way. Virtuous enterprise, according to Malloch, both makes the world a better place and makes businesses more successful (7). In fact, companies that pursue profit to the detriment of all else are unhealthy. He states, “I strongly believe that profit-only companies are, in fact, parasitic, and that they damage the economy at large with their limited and self-focused view of their role in the marketplace” (2). In addition to the well-known concept of social capital, Malloch says there is something called “spiritual capital” which those who conduct business from a faith-based perspective possess. Like any other kind of capital, it can be renewed or drawn down over time. Spiritual capital is renewed through the exercise of virtue, and he expounds on several such virtues: leadership, courage, patience, perseverance, discipline, justice, forgiveness, compassion, humility and gratitude. Practicing these virtues renews spiritual capital, and the growth of spiritual capital leads to greater success than would otherwise be achieved. I must admit that I was wary when I first began to read this book. I have read too many uncritical dismissals of capitalism as well as too many uncritical endorsements of it, and I had my suspicions that this book might fall into the latter category. As I read, however, I was glad that Malloch’s emphasis was on a classical list of virtues, rather than what has been called “the virtue of selfishness.” If anything, I wish that Malloch had spent even more time unpacking what it would mean for businesses to operate while pursuing virtue. He calls attention to several individuals and companies as exemplars of particular virtues, but I am still skeptical about whether these companies (especially Wal-Mart and Tyson Foods, which are both mentioned in the book) are actually operating under a broad list of virtues rather than just one or two. Early in my reading, I wondered whether Malloch had a purely instrumental view of virtue. That is, his emphasis on the success that doing virtuous business brings made me wonder whether he saw virtue as simply a tool to achieve the greater goal of success. He does address this objection, and I will quote him: “The examples I have given concern sincerely religious people whose faith has helped them in their business and who have been rewarded for their virtues. This is no the justification for their faith, nor has it been their motive. On the contrary, it is precisely because faith motivates them to other and higher goals, turning their minds away from the thought of profit, that they have been able to unleash, in themselves and others, the store of spiritual capital that has brought profit as one of its first effects” (118). In other words, Malloch is saying that in his examples, companies pursue virtue and experience profit as a byproduct. This is wonderful for the companies Malloch uses as examples, but I’m not sure whether Malloch’s emphasis on the close link between virtue and success is the best way to encourage companies to act more virtuously. It was good to see Malloch say, in telling the story of Malcolm Pearson (141-144), that doing business virtuously can lead to a lack of success, at least in the short term. I wish that he had taken more account of situations such as Pearson’s in his argument throughout the book, as there were times when it seemed he was saying the virtuous company could always have its cake and eat it too. This book is valuable insofar as it explores the role of virtue in doing business. Unfortunately, I think that it only scratched the surface. I am not a regular reader of WORLD magazine, but when I picked up a copy of it a few weeks ago and saw that it was their yearly “books issue,” I was curious to see what they had named as their Book of the Year. When I read that they had named as their book of the year The Battle: How the Fight Between Free Enterprise and Big Government Will Shape America’s Future by Arthur C. Brooks, I was even more curious. WORLD is a Christian magazine, and The Battle is a book that deals primarily with politics and economics, but not from a distinctly Christian perspective. I was sufficiently curious after reading the article that I checked The Battle out of the library and read it. The book is made up of four chapters. In the first, Brooks uses polling data in order to neatly split America into the 70 percent who think that free enterprise is a good idea, and the 30 percent who think that government-sponsored redistribution of wealth is a good idea. Brooks calls them the “70 percent majority” and the “30 percent coalition,” and argues that the 30 percent coalition has wielded a disproportionately large amount of influence, especially over young people. In the second chapter, he gives an example of this influence by detailing the narrative about the 2008 financial crisis given by the 30 percent coalition, and Barack Obama in particular. Brooks argues that the claims made by this narrative are false. In the second half of the book, Brooks moves from directly criticizing the 30 percent coalition to making proposals for how the 70 percent majority can win the culture war. He argues that the 30 percent coalition has a worldview that is “fundamentally materialistic,” but the 70 percent majority has a worldview that is nonmaterialistic. Though they can sometimes have a reputation for only being concerned about money, they are really concerned with human flourishing. He argues that earned success, rather than money, is at the heart of free enterprise, and earned success is the key to happiness. In order to win the war, the 70 percent majority needs to “reclaim the morality of their worldview” (97). In addition to the claim that free enterprise is about human flourishing, four other principles he lists as central are 2) “We stand for equality of opportunity, not equality of income”, 3) “We seek to stimulate true prosperity, not treat poverty”, 4) “America can and should be a gift to the world”, 5) “What truly matters is principle, not political power” (103). He ends the book by calling for leaders who are committed to “expanding liberty, increasing individual opportunity, and defending free enterprise” (126). The book is a quick read, an entertaining read, and in some places even an inspiring read. However, I still have many questions about why WORLD, as a Christian magazine, chose to endorse it as Book of the Year. The dichotomy that Brooks draws between the 70 percenters and the 30 percenters makes for an appealing argument and even better rallying cry, but ultimately I think that his dichotomy is a false one. While socialists and free enterprisers do seem to be the ideologies that draw the most supporters at the moment, Christians should not be made to feel as if they are forced to choose between one or the other. Brooks spends the early part of his book citing polling data to make the case that free enterprise is really what the majority of Americans want. To me, this indicates nothing more than the fact that the false dichotomy between free enterprise and socialism has thoroughly permeated our culture, including many Christians. Rather than listen to the people, like Brooks, who seek to get them to choose between socialism and free enterprise, Christians should seek to find a way of living and doing economics that is genuinely Christian. While the Bible is not an economics textbook, we can glean some insight from it regarding what Christians should prioritize economically. And the Bible does not appear to be completely friendly to either free enterprise or socialism. The Bible indeed mentions many texts that express the right to private property, condemns stealing (Ex. 20:15, Lev. 19:11, Prov. 23:10, Ef. 4:28), require compliance to contracts (Jer. 22:13) and demand rectification if the principle of justice in transfers is violated (Ex. 22:4-7, Lev. 5:14-16, 6:1-5, 22:14, Num. 5:5-8, Prov. 6: 30-31)… There are also many texts that support the capitalistic principle of moral desert. Trade should be honest. One should use true and honest weights and measures and not cheat the other trading partner (Deut. 25:13-16, Ezek. 45:10, Mic. 6:10, Amos 8:5, Prov. 20:10). So one should be rewarded in accordance to what one really brings to the market. Many texts in the Old Testament and New Testament support the idea that effort or productivity should be rewarded. Jesus applies this principle in the parable of the three servants (Matt. 25: 29) and the parable of the Gold Coins (Luke 19:26). Also in the Kingdom of God, everybody shall be rewarded in accordance to his or her deeds (Matt. 6:3, 19:29, Luke 6:38, 18:29-30). The apostle Paul defends a similar standard (1 Cor. 3: 8, 12-15, 1 Tim. 5:18, 2 Thess. 3:10). [T]he Bible commands several institutions that protect the poor, independently from the causes of their poverty…. For example, the poor received food during the sabbatical year (Ex. 23:10) and from what was passed over in the first harvest (Deut. 24:19-22). The hungry were to be allowed immediate consumption of food in the grain fields (Deut. 23:24) and farmers should not cut the corn at the edges of the fields, but leave them for the poor (Lev. 19:9-10). Other examples are the law of the tenth (Lev. 27:30, Num. 18:21, Deut. 12:6, Amos 4:4), the law to share with the poor food at the harvest festival (Deut. 16:11) and the prohibition on demanding interest from the poor (Ex. 22:25, Lev. 25: 36, Deut. 23:19, Prov. 28:8). Thus, aid to the suffering is not merely a matter of personal duty to be merciful. Num. 26:52-56 shows us that upon entering the promised land, Israel was commanded to divide it so that every tribe would have land proportionate to its size. All tribes, clans and families were assured that they would have enough land for their needs. Also, in Dt 15:12-15 we find that slaveholders were required not only to free their slaves in the Sabbatical year, but to provide them with means of subsistence. Of course there is debate regarding the extent to which these Old Testament laws should be normative for Christians, but it seems at the very least that Christians have a duty to fulfill the basic needs of the poor. This was not just a matter of personal giving in the Old Testament; it was a matter of law. It should also be pointed out that the poor were still responsible to build up the capital they were given, and in this I do agree with Brooks. By endorsing this book as Book of the Year, it seems to me that the editors of WORLD magazine have missed an opportunity. They could have used this book as a chance to talk openly as Christians about the best way to do economics. They could have praised The Battle for the ways in which it reflected a distinctly Christian view of economics, and critiqued the ways that it didn’t. Instead, there is only one criticism of Brooks’s book in WORLD’s review: “Brooks here should do more about the importance of biblical faith, since many people who have ‘earned success’ apart from a sense of God’s sovereignty and love hit a wall of meaninglessness as they age.” It seems to me that WORLD is wholeheartedly endorsing Brooks’s free enterprise worldview which claims that earned success is the key to happiness, but recommends he adds a little faith as a garnish. I don’t think this is an effective way to go about teaching and encouraging people to have a Christian worldview. Rather than starting with an unquestioned acceptance of free enterprise in forming our worldview, we should start with God’s story as it has played out primarily in the Bible and also in the history of the church. That should be our starting place, not adding faith to another worldview as if it were merely another ingredient. The Christian worldview centers on Jesus, and Jesus is not mentioned in The Battle. If nothing else, that ought to give us pause. The mistake that the folks at WORLD make in naming this book as their Book of the Year is that they believe both the free enterprisers and the socialists when they say that there are only two ways to live. They chose the less offensive of the two options (and yes, despite my criticism I do think free enterprise is the less offensive option of the two), but in doing so they have taken their cue from the world and lost an opportunity to discern how to do economics in a Christian way.